On January 1st, the Coney Island Polar Bears will kick off their 113th year of winter swimming with the New Year's Day Plunge into the Atlantic. 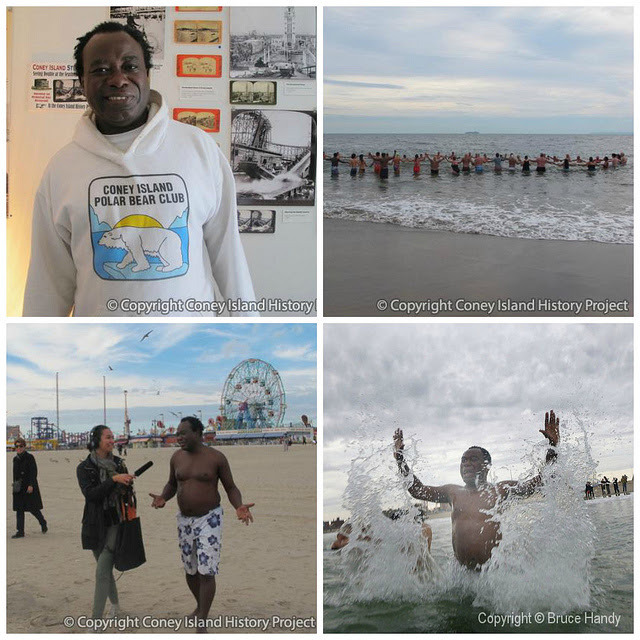 Among the recent additions to the Coney Island History Project's Oral History Archive is an interview with Polar Bear Club member Abiodun "Abi" Bello, which you can listen to on our website. Interviewer Samira Tazari mixed audio recorded on November 1st at the first swim of the season and at the Coney Island History Project's recording studio. "What most people don't know is the Polar Bears swim every Sunday from November," says Bello. "Trust me, try it one day, you're going to like it." The native of Lagos, Nigeria, has been swimming with the Bears since 2010. After moving to New York City in 1988, Abi Bello lived in Coney Island for two years, but did not swim here until a running injury sent him in search of "the best therapy." He speaks enthusiastically about the health benefits of cold water swimming, the camaraderie of the club, being the last one out of the water, and how you can join and support the January 1st Polar Bear Plunge. The Club's New Year's Day swim is a fundraiser for Camp Sunshine, which provides recreational programs for children with cancer and their families. The grand finale of Coney's 2015 season also kicks off the 2016 season with a New Year's extravaganza that includes an illuminated Parachute ball drop, fireworks, a morning swim, a ride on the Winter Wonder Wheel, and much, much more! Coney Island is no longer just a summer attraction; it's the best place to be for New Year's celebrations! This was a banner year for the Coney Island History Project. We continue our mission by recording interviews with visitors to the Wonder Wheel on New Year's Day. The recordings will be posted in the oral history archive of our newly redesigned web site. Visitors who took our walking tours also enjoyed the History Project's main exhibit, "Coney Island Stereoviews: Seeing Double at the Seashore." This exhibit of historical vintage photo technology was extremely popular, opening at a time when virtual reality is becoming an everyday reality. 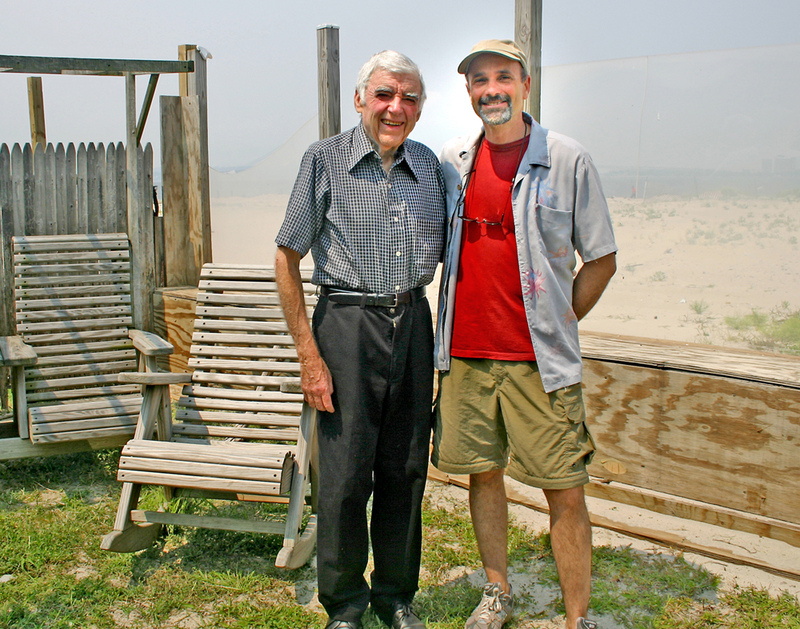 In August we teamed up with Deno's Wonder Wheel Park for our 5th Annual History Day. The event celebrated two historic milestones: the 95th anniversary of the landmark Wonder Wheel and the 60th anniversary of the classic Spook-A-Rama dark ride. Included in the day's events were free music, dancing, and historical exhibits. Coney Island continues its transition with exciting new attractions rising along the Boardwalk. The Aquarium's $127 million expansion, "Ocean Wonders," will finally connect the Aquarium to the ocean with an overlook and restaurant cantilevered above the Boardwalk. A mile to the east, the long-awaited restoration of the Childs Restaurant Building has begun. The landmark structure has been gutted to the bones, soon to be combined into an adjacent 5,000-seat amphitheater, slated to open by summer, 2016. The fight to landmark the Boardwalk continues. 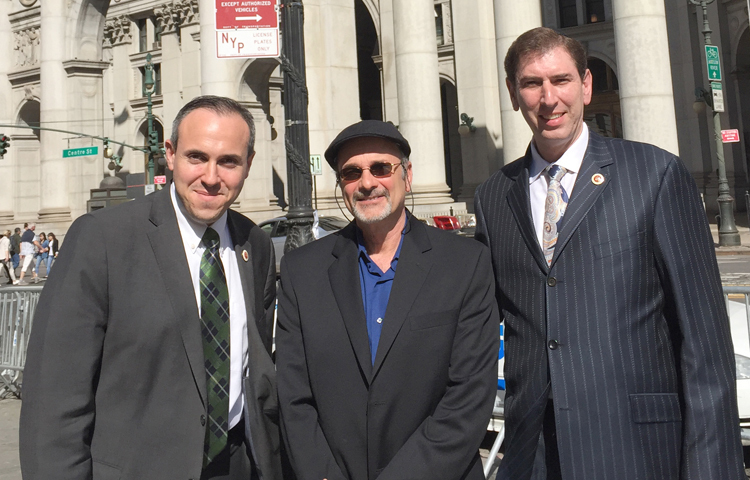 Last May I accompanied Council members Mark Treyger and Chaim Deutsch to a private meeting with the Landmarks Preservation Commission to advocate for the landmarking of the Boardwalk. I gave an illustrated historical presentation to LPC staff showing that the beloved structure is indeed eligible for landmark designation. We are still awaiting the LPC's decision. Last spring, "Coney Island: Visions of an American Dreamland," opened at the Wadsworth Atheneum Museum in Hartford, Connecticut. This extensive show, which traveled to San Diego before coming to the Brooklyn Museum, spawned four other Coney Island shows in Brooklyn, providing a variety of off-season excitement for Coney lovers. The Spook-A-Rama Cyclops, lent by the Vourderis family, and formerly the centerpiece of the Coney Island History Project, has proved to be a highlight of the show. I was honored to serve as a consultant and contributor to this extensive exhibition and its hardcover catalog. 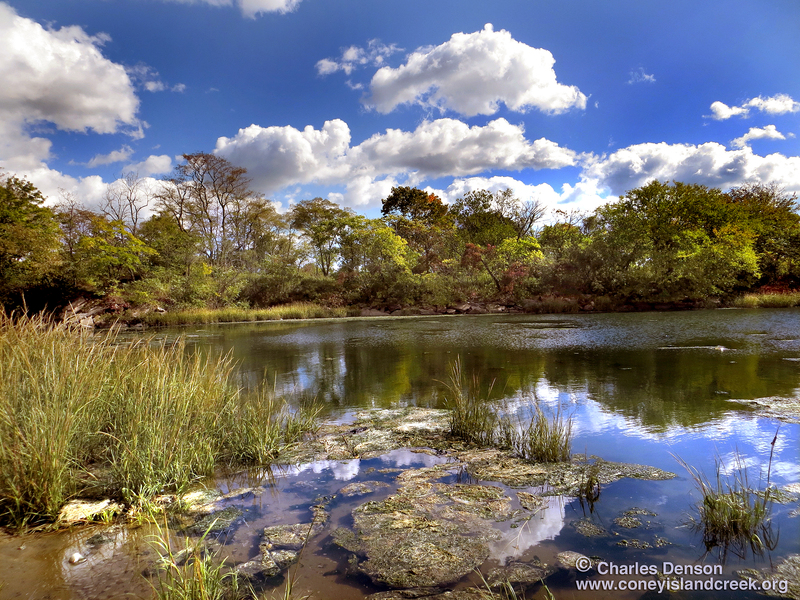 Coney Island Creek may have received a temporary reprieve after the city's proposed flood control dam was moved (on paper) from the mouth of the creek to a site farther east on 21st Street. Many issues still need to be resolved before the feasibility study concerning this dubious creek project is released in early 2016. On a positive note, Estuary Day at Kaiser Park was a great success, and the creek's art deco pumping station received a hearing for landmark status and hopefully will be restored and repurposed sometime in the future. This summer we mourned the loss of Cindy Jacobs Allman, daughter of Ruby's Bar founder Ruby Jacobs, who passed away suddenly last May. Cindy was an educator with sand in her shoes, a personable mother who somehow found the time to work long hours at the family's Boardwalk business all summer long. She will be missed. Another loss was Cha Cha Ciarcia, proprietor of the Club Atlantis Bar on the Boardwalk who passed away this fall. His Atlantis partner, J.T., died several years ago. The Atlantis closed in 2011 after a 75-year run under many owners. The space is now occupied by Tom's Restaurant. 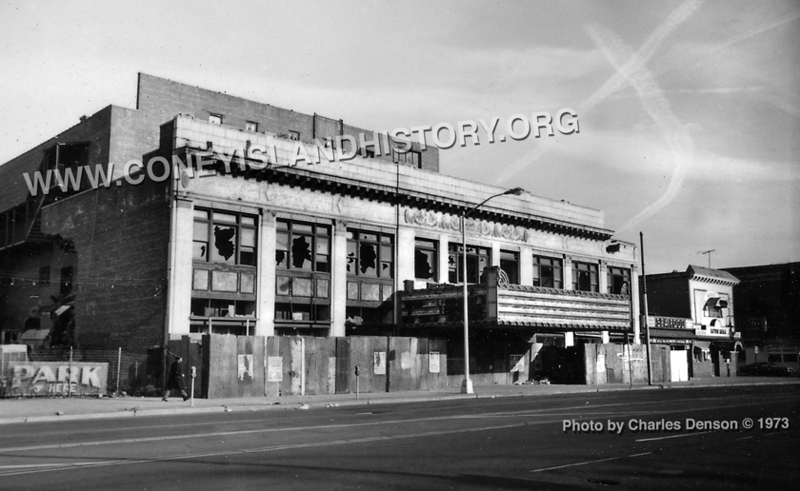 On an unfortunate note, the Shore Theater, subject of endless revival rumors, was taken over by homeless vandals who've been ransacking the landmark building for months, camping inside and out, and turning the corner of Stillwell Avenue into a garbage dump. Maybe 2016 will be the year that something positive finally happens. We can only hope. This was a year of transition and intrigue: The specter of eminent domain once again reared its ugly head as the city sought ownership of rezoned Coney properties. Developer Thor Equities grabbed more land in the heart of the amusement zone, new chain restaurants opened along Surf and Stillwell Avenues, a trendy art and food attraction opened on Thor's vacant Stillwell Avenue properties, and streets are being torn up to provide new utilities for the NYCEDC's massive residential project on what was formerly amusement-zoned Surf Avenue lots. And the late Lou Powsner, a long time Coney advocate, was honored with a street named for him. Change is in the air and all we need in 2016 is a warm and sunny summer. The Coney Island History Project invites you to support our continuing mission of education and advocacy for a better Coney Island. Please become a member, take one of our walking tours, add your voice to our oral history project, browse our web site, or come visit our exhibit center below the Wonder Wheel in the heart of Coney Island. On January 1st, weather permitting, Deno's Wonder Wheel will be open for the first-time ever on New Year's Day and begin a countdown to the Wheel's 100th anniversary in 2020! 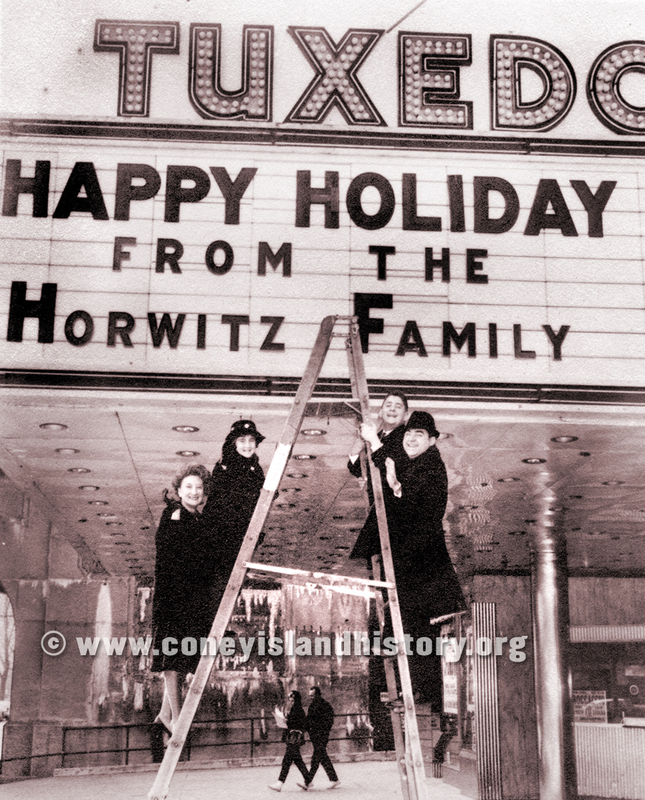 The Coney Island History Project will be on hand to record New Year's greetings at the Wonder Wheel for our Oral History Archive. Our interviewers will be stationed at the entrance and exit of the Wheel. Stop by and record your New Year's message free of charge from 11am-2pm at this special Oral History Event. The audio greetings will be preserved in our Oral History Archive with a selection available for listening online. On New Year's Day, the Wheel will open from 11am-2pm for only $5 per ride with 50% of the proceeds being donated to the Coney Island Polar Bears' charity Camp Sunshine. The Wheel will also open New Year's Eve for the first time ever, weather permitting, with FREE Rides from 9pm to 11pm. Borough President Eric Adams has announced that Coney Island's countdown to 2016 will include an array of family-friendly events in addition to the Parachute Jump's digital "ball drop" and fireworks. Don't forget to bring your quarters: The animated windows on West 12th Street which house our neighbors Miss Coney Island ("25 cents to Fall in Love") and "Coney Island Always" ("25 cents to Smile") will also be open on New Year's Day. In 2004 retired City Councilman Samuel Horwitz called me and asked me to meet with him to discuss a book project he had in mind. Sam had retired to Florida after representing Coney Island for two decades but was staying in a house in Sea Gate that he and his wife, Estelle, had rented for the summer. We met in a sunny backyard overlooking Gravesend Bay and the Verrazano Bridge. He had brought along massive scrapbooks covering his extensive career in politics and show business and laid them out on a picnic table. Sam wanted me to help him write his life story. Sam was a political warrior who’d represented Coney Island during its roughest years, a time when the area was a battleground. His political life was interesting, but it was his show biz career that interested me the most, and I think that that was true for Sam as well: he was a true impresario. 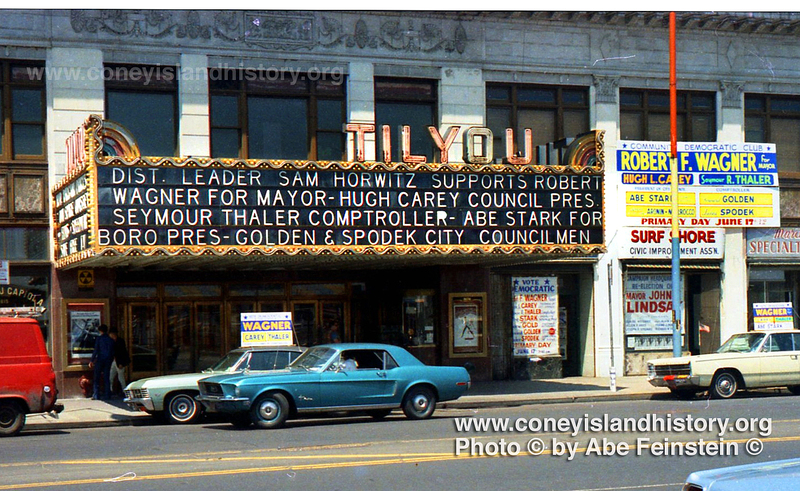 After a career as a promoter, Sam moved to Coney Island and operated three major theaters before serving as Coney’s councilman from 1973 to 1993. All of these beautiful theaters are gone but fondly remembered. The Mermaid Theater on Mermaid Avenue was where we kids spent Saturday matinees watching horror films and stuffing ourselves with candy. The RKO Tilyou on Surf Avenue was where I took my first date. The Tuxedo Theater was where I saw the first run of West Side Story shortly before the theater was demolished by Fred Trump and replaced with a parking lot. As I looked over his show biz clippings, I was impressed. 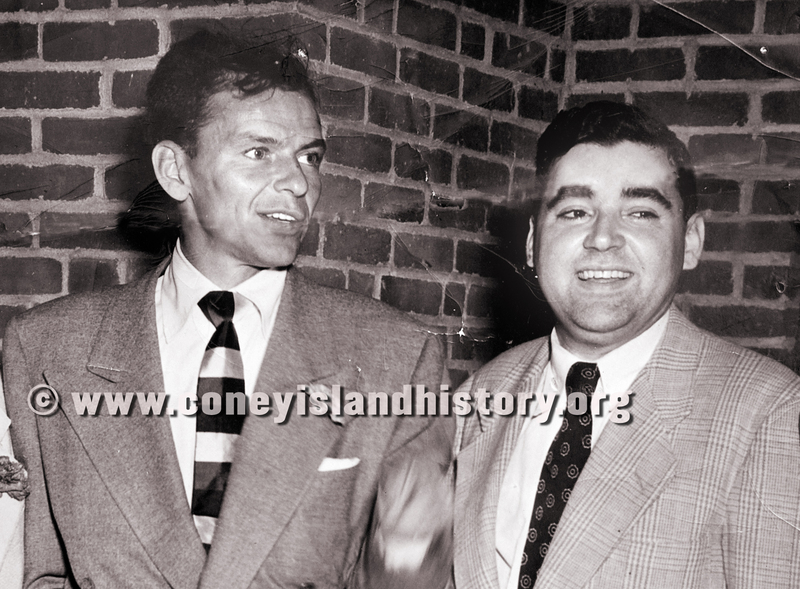 After all, who would you rather spend time with: Frank Sinatra or Peter Vallone? We kept putting off the book project and didn’t meet again until 2008 at Sam’s 90th birthday party, a huge, well-attended affair at the Manhattan Club. We joked about the long-delayed project and planned to meet again some time in the future. Three months later Sam passed away. I recently found a photograph of Sam and Frank Sinatra that was taken early in Sam’s career. In the 1980s there were rumors that Sinatra was opening a casino or buying property in Coney Island, wishful thinking for the most part. I like to imagine that the rumors were true: I imagine Frank Sinatra performing at the RKO Tilyou at a show hosted by Sam Horwitz, impresario, the man behind the silver screens. Promoter Sam Horwitz at work. 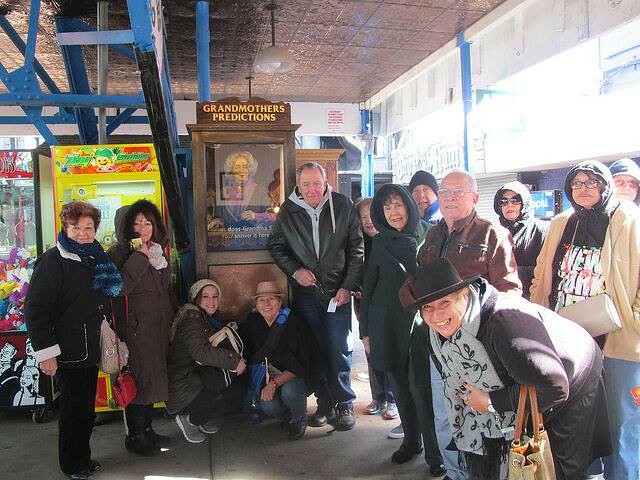 Last fall the Coney Island History Project was delighted to welcome a group of tourists from Miami for whom the highlight of their visit was meeting Grandma's Predictions at Deno's Wonder Wheel Park. Each guest came with an envelope with two quarters for a prediction and took a photo with the park's legendary 1920's fortune-telling machine. The park is now closed for the season, but we're looking forward to New Year's Day 2016, when the Wonder Wheel is set to open for the first time in its history, to kick off the countdown to the Wheel's 100th anniversary in 2020! Meet us at the Coney Island History Project on West 12th Street under the Wonder Wheel for year-round walking tours and group visits. 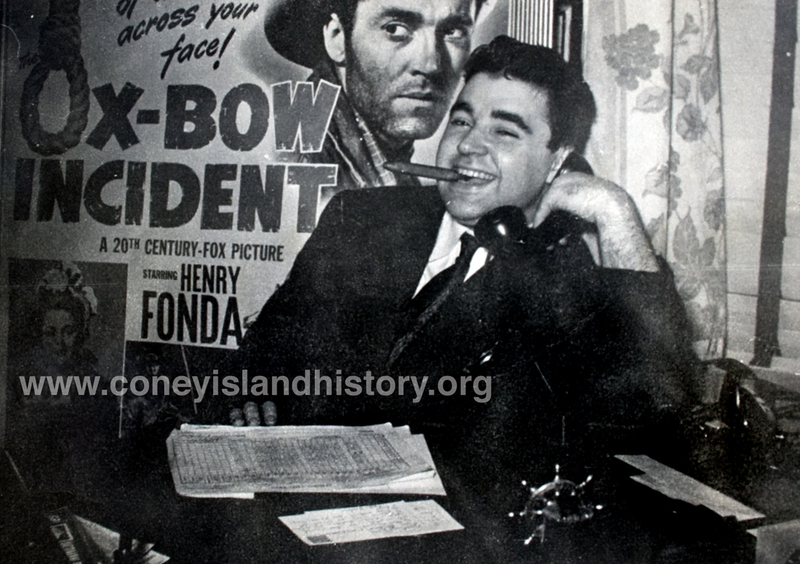 Our unique tours are based on History Project Director Charles Denson's award-winning book Coney Island: Lost and Found, the interviews from our Oral History Archive, and other primary sources. Through the fall and winter, Coney Island History Project Walking Tours are offered on Saturdays and Sundays at 12:30 pm by advance reservation only. Tickets are $20. The 1-1/2 hour tour is wheelchair accessible. Group tours may be booked any day of the week. All Coney Island History Project Walking Tours are weather permitting. If a tour is cancelled due to the weather forecast, ticket orders will be refunded. Advance purchase of tickets via our online reservation site is required for the fall and winter series. If you have a question or you would like to schedule a private tour or group visit, please email coneyislandhistory@gmail.com. Both during the holidays and year-round, you may also purchase gift certificates for Coney Island History Project Walking Tours. 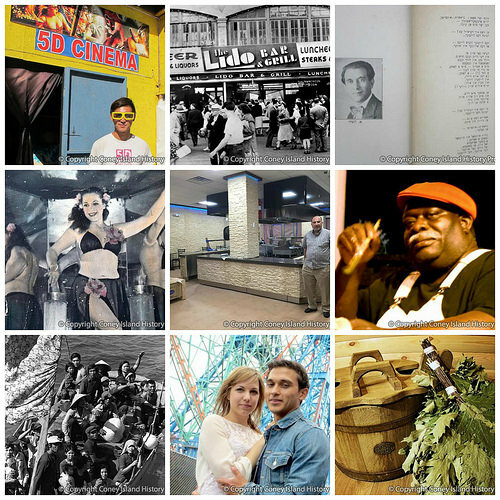 Visit the Coney Island History Project's redesigned Oral History Archive to listen online to audio interviews with Coney island residents, business owners, and visitors - both past and present - as well as our new Immigrant Narratives of Southern Brooklyn series. Among the recent additions to our online archive are the following interviews. Please listen, share, and if you or someone you know would like to record a story, message us via this page to schedule an interview. Eldorado ticket taker Mary Hood came to Coney Island as a child and worked on the Bowery well into her 90s. During the 1930s to 1950s, she worked all the sideshows in Coney Island and would also substitute for Madam Tirza at the Wine Baths when Tirza was missing in action. Charles Denson recorded several interviews a few years before she died in 2013. She was one of a kind. Hector George Wallace tells the story of his immigration from Jamaica to England to Coney Island, where he has been an itinerant sign painter for the past four decades. Wallace's painting style is ubiquitous, and can be seen on the facades of Ruby's, Paul's Daughter, and Pete's Clam Bar. Although Wallace has formal art training, his signs are Coney Island primitive and have become collectibles. His style of art work is rapidly disappearing and being replaced by plastic corporate signage. For the Coney Island History Project's first-ever "on-ride" oral history, interviewer Samira Tazari mixed recordings of her ride on the Bowery's popular 5D Cinema and an interview with the indie attraction's owner Terry Zheng. Known as "Tommy" to his fellow Coney Island business owners, he was born Cai Feng Zheng in China, and started his business in Coney Island while still in his 20s. A native of Kiev, Mermaid Spa founder Boris Kotlyar talks about bringing the Russian banya tradition to Coney Island. In the mid-1990s, together with Ukrainian-American friends who felt the lack of an authentic Russian bathhouse in Southern Brooklyn, he set about researching how to build a banya as close as possible to that which they remembered. The interview was recorded in Russian, and includes Russian and English transcripts. Eva Zucker recounts memories of growing up in a Yiddish literary household in 1940s and 1950s Coney Island and Sea Gate. Her father was the Yiddish poet A. Lutzky, who made a living writing Saturday poems for the newspaper Der Tog and organizing concerts by cantors and poets. He loved to write on trolley cars and buses going from Sea Gate to Manhattan, accompanied at times by his daughter. A. Lutzky was the pseudonym of Aaron Zucker (1894-1957). Among the more than 800,000 refugees who fled Vietnam in the years after the fall of Hanoi and safely arrived in another country are the Luong family, who were resettled in New York City and have been homeowners in Coney Island for more than 25 years. Now in his 70s and retired, Mr. Luong looks back on the hazardous journey, his first years as an immigrant, and the "sheer good luck" that brought him his first job. The interview was recorded in Cantonese, and includes Chinese and English transcripts. One Saturday in May when we arrived to open up the Coney Island History Project exhibit center, a group of people holding signs that spelled out WILL YOU MARRY ME??????? caught our eye. A couple was getting engaged on the Wonder Wheel! After Max from Brooklyn proposed to Stef from Montreal and she said yes, they shared their story with Charles Denson in our recording studio beneath the Wonder Wheel. Levent Demirgil is the owner of Coney Island Gourmet in Stillwell Terminal which was shuttered for nearly three years since being devastated by Hurricane Sandy. The interview was recorded when renovations were underway and the store recently reopened as a restaurant called Magic Gyro. He talks about the history of Coney Island, and, because "it became lively once more," his hopefulness for its future. The interview was recorded in Turkish, and includes Turkish and English transcripts. Charles Denson with the Neptune medallion on the day he donated it to the Brooklyn Museum in 1981. On November 20 a groundbreaking exhibition called Coney Island: Visions of an American Dreamland opens at the Brooklyn Museum. The connection between this show and the Brooklyn Museum has unleashed a flood of memories about my life-changing experiences at the museum fifty years ago. In 1965, when I was in the sixth grade at P.S. 288 in Coney Island, I won an art contest for a drawing I did of the newly built Verrazano Bridge. The drawing was exhibited in a student art show at the Lever House gallery on Park Avenue in Manhattan. My class made a trip to see the show, and my prize was a scholarship to attend summer art school at the Brooklyn Museum. Attending classes at the museum was one of the highlights of my childhood and I fell in love with the museum’s galleries and art school. My favorite part was the sculpture garden next to the parking lot behind the museum. At that time it was more of a junkyard than a garden. Rarely opened to the public, it was a cluttered storage area stacked with architectural artifacts rescued from demolition sites all over New York. I loved wandering among these beautiful rescued objects, and I couldn't believe that these treasures were all that remained from historic buildings that were being destroyed across the city. The garden later became more formal and was transformed into an important part of the museum. I thought of the garden as the city's architectural “lost and found” department, where lost objects might be found and (I hoped) someday appreciated and returned to their rightful places in the fabric of the city. 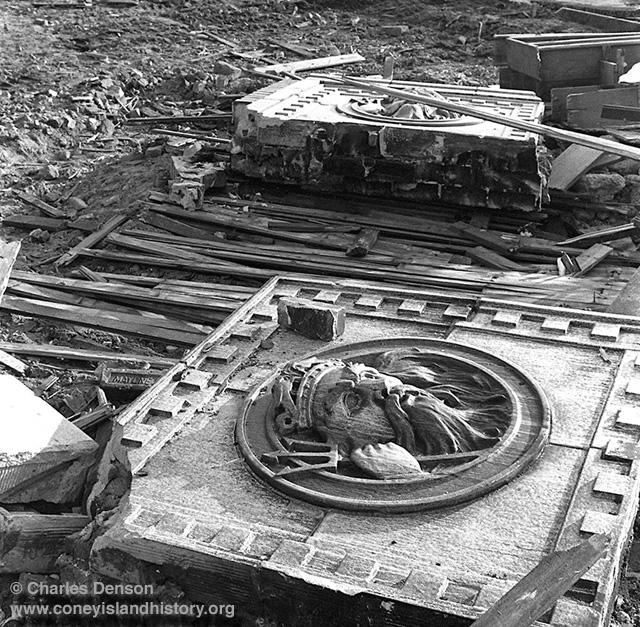 During the late 1960s I began rescuing artifacts from demolition sites all over my Coney Island neighborhood. It was not like today when architectural fragments are scavenged and sold off to the highest bidder. Beautiful buildings and their decorative ornamentation were crushed into dust below the treads of bulldozers and loaded into dump trucks. I literally worked behind bulldozers gathering anything I could. The horror of urban renewal was in full swing, and I’d become a preservationist. In 1973 a beautiful Boardwalk structure called the Washington Baths Annex was being demolished after a series of fires. The building, which we called the Pink Palace, was clad in shiny pink terra-cotta and decorated with nautical-themed medallions. After a great deal of effort, I rescued one of the structure’s shattered King Neptune medallions, took it home, and repaired it with plaster and pieces of metal coat hangers. Ten years later I donated the medallion to the Brooklyn Museum where it was put on display in a kiosk in the sculpture garden alongside other salvaged Coney Island artifacts. King Neptune had found a permanent home! I began documenting Coney Island at the age of twelve with the eventual goal of writing a book. It took me nearly forty years of primary source research to complete Coney Island: Lost and Found, and it was finally published in 2002. It was well received and won the New York Book of the Year Award from the New York Society Library. As I described in the book, the title “Lost and Found” was based on my early experiences at the Brooklyn Museum and my love of its sculpture garden and artifacts. In 2009 Robin Jaffee Frank, then at Yale, asked me to be one of the consultants for an extensive Coney Island exhibition she was proposing, and I joined an impressive team that she assembled to plan the show. We met many times, and I wound up writing the final chapter of the exhibition catalog. I was also thrilled to have my work included in the show, and to contribute photographs and ephemera to what I consider to be the best Coney Island exhibit ever assembled, a sensational show that has now come home to Brooklyn. My early experiences at the Brooklyn Museum have come full circle, and some of what was lost during my childhood has been found. 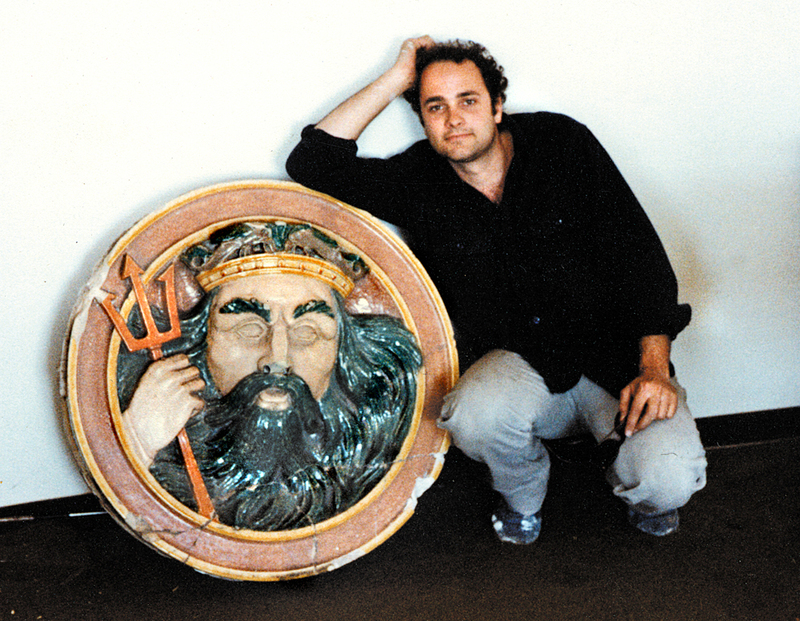 The King Neptune medallion will be on display at the Brooklyn Museum as part of Visions of an American Dreamland, partnered with some of the greatest Coney artwork ever exhibited. Many of the exquisite and rarely seen nineteenth century Coney Island paintings in the show are masterpieces that I’d studied but had never seen in person before: depictions of an undeveloped natural landscape bearing little resemblance to the modern cityscape of my old neighborhood. Robin Jaffee Frank’s illuminating exhibition is comprised of 140 pieces: classical paintings, photographs, carousel horses, artifacts, films, posters, prints, and works by Paul Cadmus, George Tooker, Weegee, Diane Arbus, Bruce Davidson, Reginald Marsh, Red Grooms, Joseph Stella, and many others who captured the essence and spirit of Coney Island. This show takes me back to my Coney Island roots and intensifies my deep appreciation for the Brooklyn Museum and what I learned there in my youth. "Coney Island: Visions of an American Dreamland, 1861-2008," Brooklyn Museum, November 20, 2015-March 13, 2016. The museum is open Wed - Sun, 11am - 6pm, on Thursdays til 10pm, and on the first Saturday of the month til 11pm. 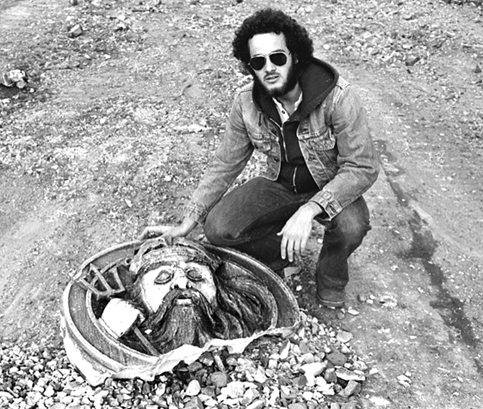 Charles Denson, 1973, rescuing Neptune medallion. 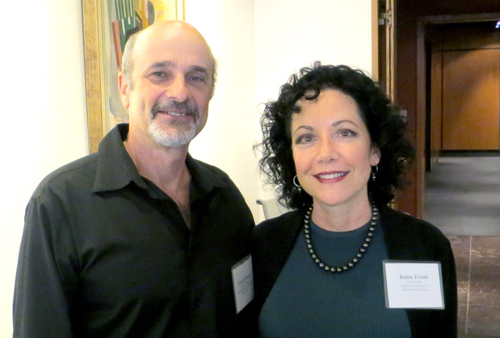 Charles Denson and curator Robin Jaffee Frank at the Wadsworth Atheneum, 2013. "Boardwalk Renaissance," a new art show based on a chapter in Charles Denson's book, Coney Island Lost and Found, is opening at City Lore Gallery on November 5th. "When I wrote the chapter about the "Artists' Renaissance of the 1980s" I wanted to pay homage to the arts groups that kept Coney in the public eye during a low point in the 1980s," Charles Denson said. " I was especially drawn to what Philomena Marano and Richard Eagan were creating with the Coney Island Hysterical Society and their Spookhouse exhibit in the old Dragon's Cave on the Bowery. I felt that their creative efforts should be recognized as an important part of Coney 's history." Steve Zeitlin, Executive Director of City Lore and an early participant in Coney Island USA events in the 1980s, met with Marano, Eagan and Denson last summer and they planned an exhibit that would illuminate the artistic and preservationist activities of the artists who found a home in Coney Island during a tumultuous decade. "Some of the artwork displayed in my book can be seen in this exhibit," Denson said, "As Coney Island becomes more corporate it's important to remember what was accomplished in the past by committed and talented individuals working on a small scale. They made a huge difference." 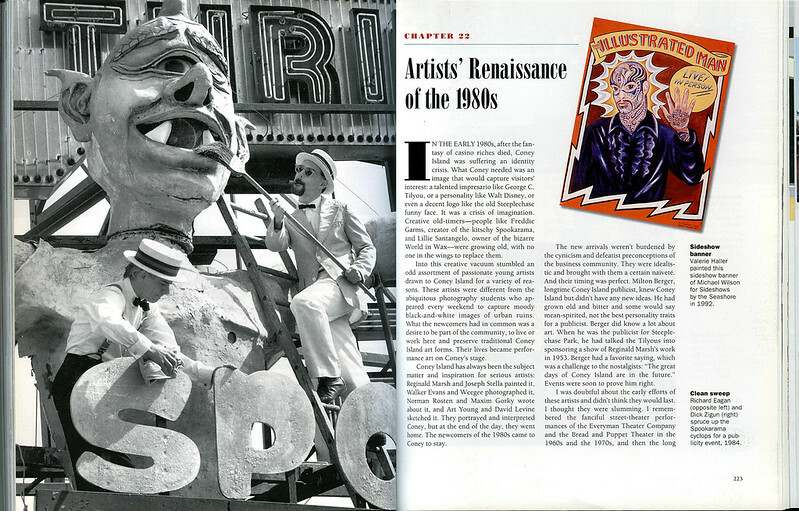 "Boardwalk Renaissance: How the Arts Saved Coney Island," City Lore Gallery, 56 East 1st Street, NYC 10003. Opening November 5, 7-9pm. Exhibit extended through May 8, 2016. Gallery open Wed - Fri. 2pm - 6pm and Sat - Sun. 12pm - 6pm. Free admission. 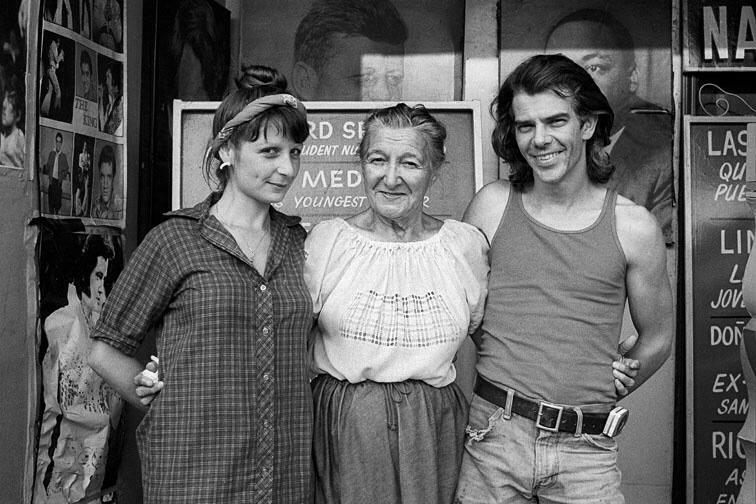 Coney Island Hysterical Society's Richard Eagan and Philomena Marano with the World of Wax Musee's Lillie Santangelo in 1982. Photo © Hazel Hankin. On the eve of the third anniversary of Hurricane Sandy: "10/29: Sandy and Gorecki's Symphony of Sorrows, No. 3," a film by Charles Denson shot in Sea Gate during and after the storm. Some of this footage appeared in his Sandy documentary, "The Storm." The Coney Island History Project's director rode out out Sandy in Sea Gate, where his apartment and car were destroyed by the storm surge. "I thought, 'nobody's filming this. I've got to record this,'" Denson said in an interview in the Brooklyn Paper in 2013/. "I realized, it's very different when you actually experience something and put your life on the line to record something," Denson said. 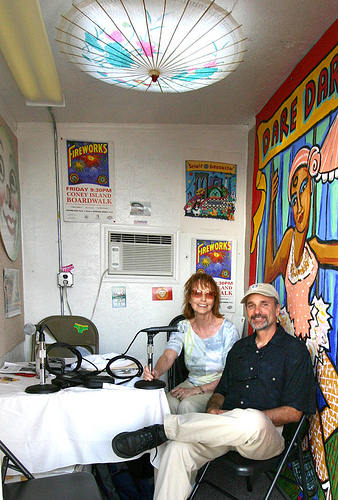 Eleven years ago Astroland owner Carol Albert and author Charles Denson founded the Coney Island History Project as an oral history program whose mission was to record Coney Island in living memory. Little did we know that we would be capturing the last days of an important era in Coney history. Since our founding, Coney Island has undergone a dramatic revival and been transformed. During the last tumultuous decade we were able to record important oral histories, including those of the last members of Coney's pioneer families as well as an extensive cast of characters who contributed to Coney's illustrious past. Some of the subjects, such as Matt Kennedy and Joe Rollino, were centenarians who vividly recalled and shared a hundred years of memories. Many other subjects passed away during the last decade but not before sharing their fascinating stories with us. With the launch of our new website we strengthen our mission of recording and archiving oral histories. The improved format and mobile-friendly web design provide a quicker and easier way to navigate and access our extensive library of archival materials and important information regarding Coney Island and our public programs. The expanded architecture allows us to add to the archive hundreds of interviews and unseen photographs, maps, and ephemera. New technology enables us to clean and restore older recordings, including two decades of recordings made by Charles Denson for his book Coney Island: Lost and Found. We can now begin sharing our vast archive of materials. Also highlighted is our latest project: Immigrant Narratives of Southern Brooklyn. This project is an oral history initiative that records interviews with immigrants in both English and other languages in the Southern Brooklyn neighborhoods of Coney Island, Gravesend, and Bensonhurst. You can listen to the first oral histories from the series with New Yorkers who emigrated from Hong Kong, Japan, Vietnam, Pakistan, Cyprus, Turkey, Russia, Georgia, Poland and Mexico. The first interviews were conducted in English, Russian, Cantonese and Turkish. This program is part of the Cultural Immigrant Initiative supported, in part, by the New York City Department of Cultural Affairs in partnership with the City Council, and New York City Councilman Mark Treyger.